Suitcase Fusion, a professional font-management utility designed for individual users, has seen a giant upgrade with the release of version 2. The program has been entirely rewritten using code borrowed from Extensis’ Universal Type Server product. The result is increased speed and responsiveness—especially for adding and auto-activating fonts—and several clever new features that encourage typographical experimentation. You can preview any selection of fonts, whether active or not, in several different sample layouts, or by typing in a line of your own text. Then you can drag type samples off of the Suitcase window and float them over your page layouts to see how they would look. These previews can be used with any document or application, and if you change the characters, fonts, or sizes in the Suitcase window, the floating previews update as well. When you find one combination you like, you can activate that font directly from its floating preview. This is an entirely new way to interact with fonts. Also new: the Glyph View palette. 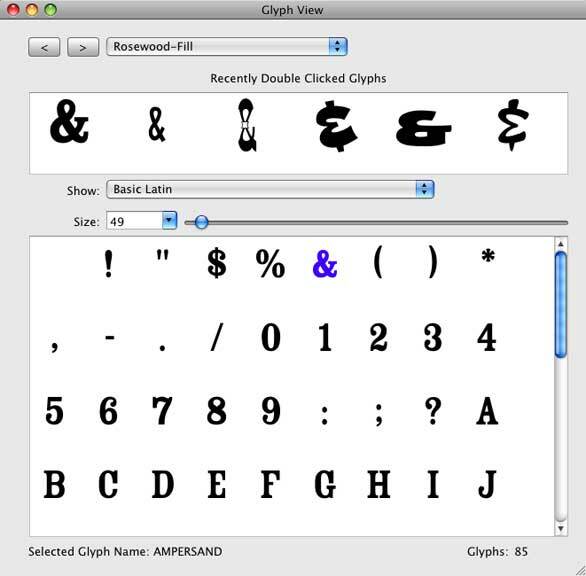 While QuarkXPress ( ) and Adobe’s Creative Suite design applications have Glyphs palettes, and Mac OS X has a Character palette, they can show only active fonts. Fusion’s Glyph View palette lets you explore both active and inactive fonts. When you find a glyph you want, double-click it to see a larger version, then select a different font to see the same glyph in the new font. It’s a helpful way to compare similar fonts, or find just the right ampersand or other special character, in any language. Fusion 2’s new interface is similar to that of iTunes ( ) or iPhoto ( ), and now it includes Smart Sets that automatically update as you add new fonts to your library. For example, you could define a Smart Set to include all fonts from one particular foundry, or fonts that are tagged with a particular client’s name, or any other combination of attributes. When new fonts with these attributes are added to the library, they also appear in the Smart Set. The new Fusion 2 Glyph View palette lets you explore and compare characters among multiple active or inactive fonts. Printing has been enhanced, with a new ability to print your own line of text in any combination of fonts. And, in response to user requests, Suitcase Fusion now uses a background application to handle font activation, so you can quit Fusion whenever you’re not actively managing or previewing your fonts. Extensis also rethought its approach to managing fonts in the Mac OS X system font folders. You can now activate and deactivate the optional fonts in the various system font folders, but Fusion won’t let you deactivate fonts that are required by the system. Like previous versions of both Suitcase and Suitcase Fusion ( ), Fusion 2 can automatically activate fonts in applications that you specify, or that have a Suitcase plug-in installed. Fusion 2 includes plug-ins for Adobe InDesign ( ) and Illustrator ( ) versions CS3 and CS4, and for QuarkXPress 7 ( ) and 8. These plug-ins also work with Fusion’s high-level font identification and a matching feature called Font Sense, which identifies fonts very specifically and then adds that information to documents that contain those fonts as they’re saved. When you reopen the document, even if you have several fonts installed with the same name, it will find and activate the exact font used in that document. You can enable and disable those plug-ins from within Fusion 2, so that updates to Fusion can also apply updates to the plug-ins. The plug-ins also allow you to customize auto-activation behavior from within each supported application. For example, you can choose to let Fusion 2 auto-activate fonts used in linked graphics, activate entire font families when only one font is called for, deactivate fonts when the document closes or the application quits, and so on. From within these applications, you can also tell Fusion to create a new set from the fonts used in the current document, or collect that document’s fonts into a folder—this is especially handy in Illustrator, which lacks this feature. And because Fusion 2 can access multiple font libraries, the plug-ins let you control which library to use for auto-activation. This makes it possible to use different libraries for different clients or departments. Fusion 2 has dozens of other helpful features: you can view fonts by family, drag-copy fonts to the desktop, create new sets by dragging font folders onto the application’s window or Dock icon, temporarily add fonts by dragging them onto the Dock icon, categorize and search for fonts by dozens of criteria, and more. Although you can tell Suitcase to access font files on your hard drive, the safer approach is to let it copy all your fonts into its Font Vault, where only one copy of each font can exist. Besides eliminating duplicates, this also avoids any confusion caused by users moving font files around in the Finder. Fonts are checked for basic corruption as you add them to Suitcase, but Extensis also includes the FontDoctor utility from Morrison SoftDesign. Extensis strongly recommends that you use FontDoctor to clean up your font collection before importing fonts into Suitcase. Fusion 2’s Floating Preview feature lets you view multiple font samples above any document in any application to see what they look like in an actual layout. I had some difficulty adding fonts that Suitcase flagged as corrupt, or fonts that were missing printer font files. Although Suitcase gave me a choice of either “Don’t Add” or “Add In-Place” (which keeps the fonts outside the vault, but still lets you activate them), the second option didn’t work for me. The fonts were then listed as being in the vault, so there was no easy way to determine which ones were considered damaged. I hope Extensis fixes that problem, because it makes it impossible to deal with damaged fonts. In order to upgrade from Fusion 1 to Fusion 2, you’ll need to be running Mac OS X 10.4 (Tiger) or 10.5 (Leopard). However, Fusion 2 doesn’t include plug-ins for some older programs, such as Adobe Creative Suite 2 or QuarkXPress 6, so upgrading means losing your plug-in capabilities in those application versions, if you’re still using them. Conversely, if you use Adobe Creative Suite 4 or QuarkXPress 8, you must upgrade to Fusion 2 if you want to use its auto-activation plug-ins—the previous version of Fusion doesn’t have plug-ins for those newer apps. This can be confusing or inconvenient for some users. If you don't need to share a font library across a workgroup and you're looking for a font management utility, Fusion 2 has plenty of unique features to get excited about. It adds and activates fonts in a snap and you can preview your fonts on your actual layout. Its Glyph View palette helps you explore your fonts, and Smart Sets make it easy to organize fonts by any criteria you like. This article was updated on 4/1/09 to acknowledge that Suitcase Fusion 2 (version 13.1, available via a software update from the original) now works with OS X 10.4 (Tiger). The update took place after this review was published.